Turtle T. Turtleson - Coming from a family of fierce competitors, Turtle always knew that he would be a participant in the Great Race. And while he gives every race he runs the old Turtleson determination, his heart will always belong to his first love - Flower arranging. But to look at him tear up the racetrack you wouldn�t know that his head was filled with daffodils and dandelions. He ruthlessly (and adorably) pounds down the path focused on the finish line, destroying anyone and anything that gets in his way. It is how he was raised. It is the Turtelson way. Turtle resides in Willow Swamp with his mother and father Bart and Alice Turtleson. He enjoys skiing, reruns of Small Wonder, and spelling words with numbers. Robert �The Bob� Bunny - Born into a family of artist and entertainers, while growing up, the race track was the furthest thing from Bunny�s mind. His brothers would go on to be entertainers and spokesmen on a worldwide scale and he aspired to do the same. One day while writing a poem on the shore of Glowing Creek a gust of wind swept his parchment up and whisked it away. Running down the river�s edge after that paper Bunny discovered a new love... for speed. He felt the �need for speed�, if you will, much like a junkie or a fighter pilot with enormous teeth. 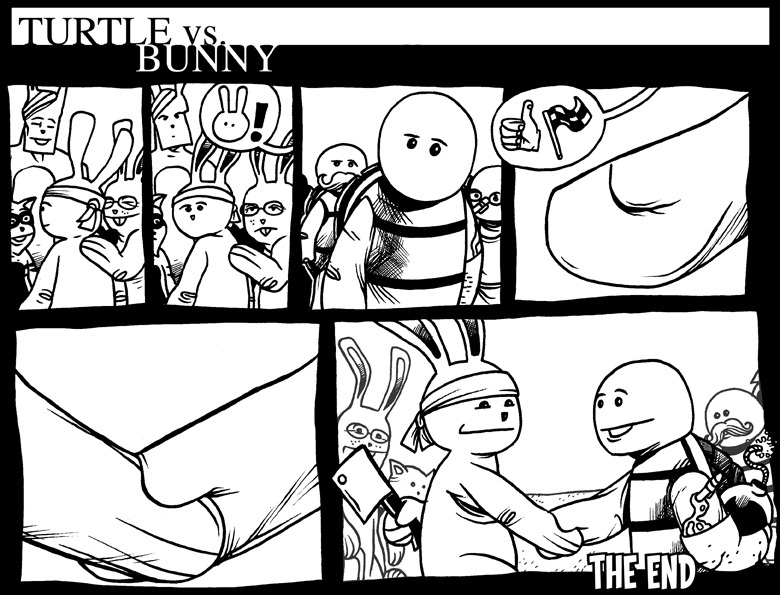 From that moment on Bunny dedicated himself to the race taking on any and all challengers. Sadly, for all his energy and enthusiasm, Bunny was simply not the quickest animal out there, and his kind demeanor made him a push over in the racing circles. After this years devastating loss, Bunny plans to hit the training room and return for next years race as a lean mean running machine. With determination like that and a big family supporting him anything could happen. But with a record of 0-23 no one�s holding their breath. Grandpa Turtle As a former winner of the Great Race himself, Grandpa Turtle is determined to see his grandson carry on the fine family tradition, and he�ll do whatever he has to do to make sure it happens. No matter what little Bunny gets in the way. Grandpa Bunny - Where Grandpa Turtle helps his grandson with an iron fist Grandpa Bunny chooses to help with words of support and a helpful suggestion. This quiet and kind old rabbit has had his day in the sun and finds peace in seeing his grandson enjoy the competition. Mama Turtle - Mama Turtle has little interest in the race. That is until her son�s life is threatened. Then, like any good overprotective parent, she bursts into action taking out anyone that means her little boy harm. With bursts of adrenaline that leave her with an seemingly limitless amount of strength there is nothing more powerful than a mother�s love. Easter Bunny - This famed holiday mascot was more than happy to take some time away from his busy egg hiding schedule to help out his little brother in the race. After all, if a worldwide celebrity with arms like tree trunks can�t scare off a bear attack, than nothing will. Billy �Crash� McKitten - The son of Bill and Mary McKitten always dreamt of flying. His dreams came true when he got a job piloting a helicopter for the Catburg News covering traffic, migration, and races. The future looked bright for this spunky young upstart. A new career, a litter on the way...He will be missed. The Question Troll � �Answer me these questions three.� And you best answer truthfully lest the old Question Troll turn you away. Unfortunately, due to a short-term memory problem, the Question Troll�s questions are relatively easy one�s to answer. If you know who you are and where you�re going, you should be good to go. Turtle in the Clouds - What happens when we die? Who knows, but we do know what happens when Turtle catches a beat down and finds himself drowning in two feet of water. He has a fever dream about a strange Turtle angel that doesn't speak and apparently is a bit of a biter. Bears - All bears, be they cave dwellers, forest inhabiters, civilized or wild have one thing in common. They hate bunnies. Heaven knows why, but it�s rumored that the unspoken feud goes back to the earl years of the great race. They had better figure out what the problem is soon, because until they do, these grizzly beasts will continue to thwart the Bunny families attempts at winning the race. Edna and Ernie Fragile (the birds of Fragile Rock) - When you come upon the towering cliffs of Fragile Rock, it�s best to walk around than climb up an over. Because the only thing awaiting you at mountain�s top is this pair of angry birds trying to retire in peace.